Zebrafish (Danio rerio) is a popular vertebrate model organism largely deployed using outbred laboratory animals. The non-isogeninc nature of zebrafish as a model system offers the opportunity to understand natural variations and their effect in modulating phenotype. In an effort to better characterize the range of natural variation in this model system and to complement the zebrafish genome project, the whole genome sequence of a wild zebrafish at 39 fold genome coverage was determined.Comparative analysis with the zebrafish reference genome revealed approximately 5.2 million single nucleotide variations and over 1.6 million insertion deletion variations. The dataset thus represents a new catalog of genetic variations in the zebrafish genome. Further analysis revealed selective enrichment for variations in genes involved in immune function and response to the environment, suggesting genome-level adaptations to the environmental niches. we also show that human disease gene orthologs in the sequenced wild zebrafish genome show a lower ratio of nonsynonymous to synonymous single nucleotide variations. A sequence-based variation map of zebrafish. Zebrafish (2013) March 2013, 10(1): 15-20. doi:10.1089/zeb.2012.0848. Cover Art: Zebrafish in Nature – in this issue, two papers report on the exploration of zebrafish in the wild. Muthukumarasamy et al. 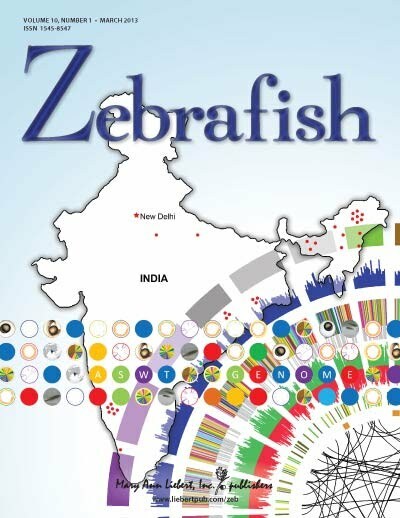 (pages 1–14) report on the natural history of zebrafish in India, and Patowary et al. (pages 15–20) report on the genomic sequence of a wild-caught zebrafish.